Let’s TOUCH the East Bali !! 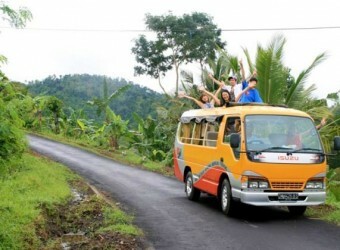 Bali Activity Eco-tourism is "the touch" and will go out to an odyssey without the scenario! The concept of this tour will touch bare Bali while touching the people of the "hometown! A thing called ". There is not the decided route and informs the various Bali spots by the day. This is a trip rather than a tour. I see real Bali by touching the life of local people, culture, the Nature. * You will find Balinese crops such as fruits, vegetable etc. 7．Pass through Sidemen area 8．Lunch 9．Tour by an open-car Touch together !! 10．Make contact with local people. Feel a truly Balinese hospitality ! 11．Arrive at hotel 5.00 to 6.00pm. Hotel Departure to Return Time approximately 9.5 to 10 hours. Nusa Dua, Jimbaran, Kuta, Tuban, Legian, Seminyak, Sanur, Ubud and Tanah Lot area. ※The fee and schedule might be changes withour any notice by the sponsor. Balinese people are friendly. I cannot speak Indonesian but I desperately tried to talk. Smile of local old woman was impressive. I think it was a tour to know about Bali deeply.